Drivethedeal has some excellent deals on brand new Toyotas, all supplied by UK main dealers, including Road Tax and free delivery to your door. With a choice of 3 years free servicing or an upgrade to 5 years manufacturer warranty on every car, there has never been a better time to purchase a new Toyota. With savings of up to £1,700 off a new Toyota Aygo, or up to £3,600 off a new Toyota Verso both with 3.9% APR finance, these deals are not to be missed. Toyota Aygo 1.0 VVT-i 3dr £6,928 Saving £1,292 & 3.9% APR finance. Toyota Aygo 1.0 VVT-i 5dr £7,249 Saving £1,320 & 3.9% APR finance. Toyota Aygo 1.0 VVT-i Blue 3dr £7,892 Saving £1,568 & 3.9% APR finance. Toyota Aygo 1.0 VVT-i Blue 5dr £8,207 Saving £1,603 & 3.9% APR finance. Toyota Aygo 1.0 VVT-i Platinum 5dr [AC] £8,207 Saving £1,603 & 3.9% APR finance. Toyota Aygo 1.0 VVT-i Platinum 5dr [AC] MMT £9,107 Saving £1,703 & 3.9% APR finance. Toyota Yaris 1.0 VVT-i T2 3dr £8,476 Saving £1,769 & 3.9% APR finance. Toyota Yaris 1.33 VVT-i TR 3dr  £9,828 Saving £2,132 & 3.9% APR finance. Toyota Yaris 1.33 VVT-i TR 5dr  £10,278 Saving £2,182 & 3.9% APR finance. Toyota Yaris 1.4 D-4D TR 5dr  £11,241 Saving £2,289 & 3.9% APR finance. Toyota Auris 1.33 Dual VVTi TR 5dr £12,437 Saving £3,136 & 3.9% APR finance. Toyota Auris 1.6 V-Matic TR 5dr £12,755 Saving £3,173 & 3.9% APR finance. Toyota Auris 1.4 D-4D TR 5dr £13,767 Saving £3,308 & 3.9% APR finance. Toyota Verso 1.6 V-Matic T2 5dr 7 seat £14,382 Saving £ & 3.9% APR finance. 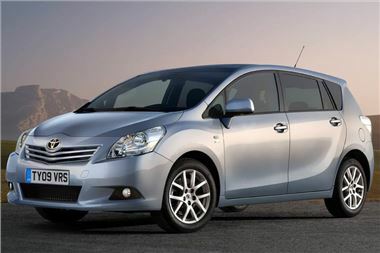 Toyota Verso 2.0 D-4D T2 5dr £15,934 Saving £2,979 & 3.9% APR finance. Toyota Verso 2.0 D-4D TR 5dr £16,847 Saving £3,092 & 3.9% APR finance. Toyota Avensis Saloon 2.0 D-4D TR Nav 4dr £17,292 Saving £3,249 & 3.9% APR finance. Toyota Avensis Tourer 2.0 D-4D TR Nav 5dr £18,192 Saving £3,349 & 3.9% APR finance.